Ouagadougou (Agenzia Fides) - Radicalization widespread in different areas of the Country; challenges of marriage between Christians and Muslims; instrumentalization of religion; violent extremism; disputes of civil and legal authority. 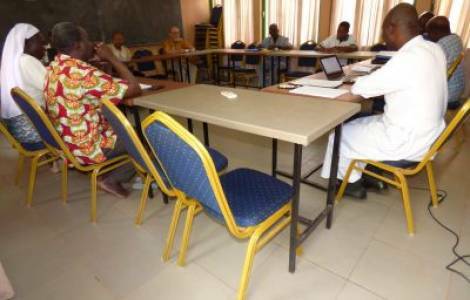 These are the main themes discussed in the Second General Assembly 2018 of the Episcopal Commission for the Islamic-Christian dialogue, which was held from 10 to 12 April at the National Cardinal Paul Zoungrana Center in Ouagadougou, capital of Burkina Faso. During the works, the delegates from the various dioceses of the Country reiterated their commitment and enthusiasm for the Islamic-Christian dialogue, especially in ordinary life, but they did not hide the difficulties they have to face. To complicate matters is the recent expansion of violent extremism. At the end of March, the discovery of the existence of a group called "Islamic security", a sort of religious militia, in Pouytenga, 140 to the east of Ouagadougou, provoked strong controversy. After carrying out an investigation in Pouytenga, the Fédération des associations islamiques du Burkina (FAIB), reassured the population, stating that this group is the non-armed service of the local Sunni movement, in charge of protecting the faithful in mosques and during some religious ceremonies. On March 28, however, the government decided to dissolve the group. The existing tensions should not discourage Christians and Muslims from continuing on the path of dialogue. As Fr. Arcadius Sawadogo, General Secretary of the Episcopal Commission for Islamic-Christian Dialogue, says, "we faced these issues in order to trace paths to meet each other".